The Ring O' Fire is mainly supported by our family and friends who come from all walks of life. Being past Ring O' Fire runners, members of the local hiking club or ex-military they all have the intimate local knowledge and enthusiasm to help drive our runners from check point to check point and across the finish line. 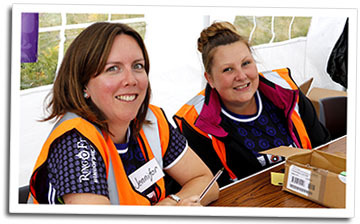 Our volunteers are full of beans, hard working, dedicated and show great enthusiasm to every runner taking part in RoF. Many of our volunteer team come back year after year and give up a lot of their time to support the race - we honestly couldn't do it without them. Although we tend to work with people we already know, we also recruit a small number of people each year to help support the race. We are always keen to hear from former Ring O' Fire runners who understand the race and want to give something back. Could this be you? Do you want to get involved, help others runners and learn more about how an international ultra marathon race works? Turn up and help set up the start line base camp, stay overnight with the runners in the sports centre/town hall or arrange your own accommodation. It is a great experience supporting an international ultra running event. Not be too scared of the dark! All volunteers receive a coveted Ring O' Fire technical running t-shirt. If you commit to help us for one day we can offer you a free place in the Firelighter race the following year. If you commit to help out of two days or more we can offer you a guaranteed place in the Ring O' Fire race the following year. Or the Firelighter if you prefer something a little less than 135 miles! We also host an after party for our marshal team every year. And you can expect lots of food and beer but please don't let this be your sole motivation for helping out! If you would like to help with the 2017 events, please apply online here. "Thanks for a great weekend. Im sure you guys are feeling just a wrecked if not more as us runners are. It was a truly brutal challenge."